No Forced Escrow! - Handle Your Own Funds! 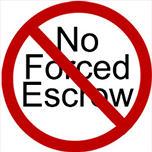 No Forced Escrow! – Handle Your Own Funds! We believe you are responsible enough to handle your own funds and do not need to be forced into opening an escrow account like other agencies do. By handling your own funds you have full control throughout the program. Here at PCS Debt Relief, we assure there are no forced escrows, unlike many other debt relief agencies, we do not set aside your payment in an escrow account to pay for interest that has accumulated on loans. Escrow accounts can result in a higher interest payment monthly. We pride ourselves on no monthly fees, fixed rates or forced payments. Don’t allow yourself to be under the control of debt or credit business that promise you relief and recovery; when in actuality they are costing you more money. Many other debt relief companies will force clients into escrow accounts after less than a month of being late. It is not our mission to take soul excess of your funds or force you to open an unnecessary account. We are a debt relief business believing each of our clients is responsible and competent enough to handle their own funds. Priding ourselves on being THE most trusted debt relief agency, along with that honor comes the obligation to attain the best results and security for our clients. We understand each individual must hold full control of his or her finances during the course of debt and credit recovery. This is a process of recovery, our advisors want each client to feel confidant in their abilities to be financially sufficient and aware. PCS Debt Relief is here to educate not control. We are not a debt relief agency that acts as a third party to force escrows on accounts to pay for existing debt. But an agency that acknowledges their clients are struggling with payments, thusly; we do not want to add on to your stress our debt payments. We are here to allow you to rid yourself of debt the way you see fit and appropriate. Before going further with a debt relief or bankruptcy program, please allow us to give you debt relief options that will bring you great satisfaction and have you one step closer to credit and debt recovery! Don’t hesitate on learning what our advisors can do for you; call us today to schedule an appointment!